Spring pothole repair in New Haven. Advocates for cities and towns pressed Gov. 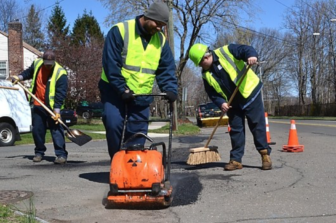 Dannel P. Malloy’s administration to release nearly $30 million in road repair grants owed to municipalities before June 30. While the administration has not refused to release the Town Aid Roads (TAR) grant payments, it has warned that funding could be stalled until legislators stabilize a state transportation program headed for insolvency by next fiscal year. The state budgeted $60 million in TAR grants for the full fiscal year. The state normally delivers half to communities in July and the remainder in January. Connecticut borrows the funds, financing the grant payments through the sale of bonds on Wall Street. The legislature did not adopt a new budget for this fiscal year until late October. The State Bond Commission approved bonding for the first $30 million installment at its Nov. 29 meeting, and the governor’s budget office — which controls the bond commission agenda — released the funds to communities shortly thereafter. The administration has scheduled another bond commission meeting for Friday, but the second $30 million installment is not on the agenda. Chris McClure, spokesman for the governor’s budget office, said earlier this week only that the bond commission will have more opportunities to meet before the fiscal year ends on June 30. But Malloy already has warned that the instability of the Special Transportation Fund, which would cover — among other things — the debt payments on the TAR bonds, needs to be addressed. Malloy warned Wall Street investors, the business community and the legislature earlier this winter that Connecticut’s transportation program is on the brink of a crisis. Absent more funding, the state would need to scrap some rail services, drive up fares, suspend 40 percent of planned capital projects, including major highway rebuilds like the Hartford viaduct, to remain solvent over the next five years, the administration says. The governor asked legislators this month to add seven cents to Connecticut’s 25-cents-per-gallon retail gasoline tax, and to order electronic tolling on highways. The latter, if approved, probably would not yield major revenue until the 2021-22 fiscal year, the administration says. “We agree with CCM that repairing and maintaining transportation infrastructure is vitally important to Connecticut and those rising costs present difficulties when revenues are strained — as this is a case the Malloy administration has been making for years,” McClure said Thursday. The Senate is split evenly 18-18 along partisan lines. Democrats hold a narrow 78-71 edge in the House.